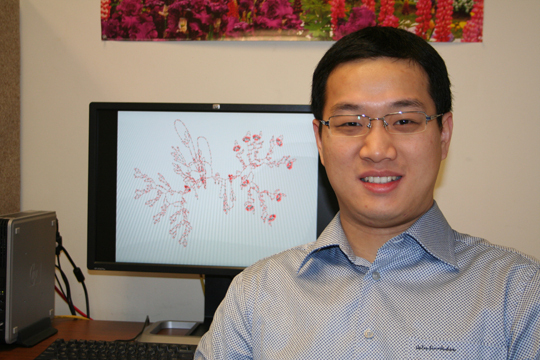 IMAGE: Hongwei Liao, with a graphic of the Gadara Petri net model of the main() function in the OpenLDAP software showing on the screen behind him. Hongwei Liao, a graduate student in the Electrical Engineering:Systems program, received a Rackham Predoctoral Fellowship to support his research while he completes his dissertation on Modeling, Analysis, and Control of a Class of Resource Allocation Systems Arising in Concurrent Software. The Rackham Predoctoral Fellowship is awarded to outstanding doctoral candidates in the final stages of their program. In the past decade, computer hardware has undergone a true revolution, moving from uniprocessor architectures to multiprocessor architectures, or multicore. In order to exploit the full potential of multicore hardware, there is an unprecedented interest in parallelizing the applications that were previously conducted in series. This trend forces parallel programming upon the average programmer. However, reasoning about concurrency is challenging for human programmers. The computer industry faces a crisis because multicore architectures are making parallel programming unavoidable but concurrency bugs are making it too costly and error-prone. 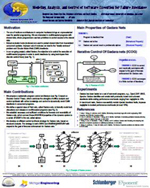 The broad context for my research is the Gadara project [see 2009 article in Computer Magazine], which applies Discrete Control Theory to computing problems. My dissertation attacks the concurrency crisis by developing new ways to eliminate concurrency bugs automatically. Building on the foundation of Discrete Control Theory, my dissertation develops a novel multi-disciplinary framework for modeling, analyzing, and dynamically controlling concurrent software execution to provably eliminate an important class of failures, circular-wait deadlocks, which arise when tasks prevent one another from making forward progress. The Gadara project is supported by NSF and HP Labs. The proposed formal modeling and control framework will provably eliminate the potential circular-wait deadlocks in software, and allow programmers to write correct and efficient software with increased safety, confidence, and productivity. Moreover, my research also contributes new theoretical developments on the control of Petri nets. It also has significant potential to be extended to a broader class of resource allocation systems. His thesis advisor is Prof. Stéphane Lafortune, a member of the Systems Laboratory.